Huhuonline.com can report today, that David Edevbie, principal secretary to the President Yar`dua is in Jeddah, Saudi Arabia. As huhuonline.com previously published, on Tuesday 22nd December 2009, the principal secretary to president, David Edevbie received instruction to come to Jeddah for the sole purpose of writing the handover letter, but as preparation was being made for him to proceed to Jeddah, a counter instruction came for him to tarry”. Continuing the source said “The leadership of the National Assembly, a section of the Nigeria media are on standby”. 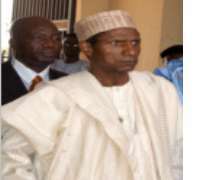 Huhuonline.com understands President Yar`adua insiders have continued to oppose the transmission of a letter to the National Assembly over his medical leave, and have worked tirelessly at putting an end to it. To this end, David Edevbie left Abuja with a copy of the 2010 budget, which requires the signature of President Yar`dua, who is presently in a coma at the King Faisal Teaching Hospital. The question now is who will sign the 2010 budget? It is certainly not President Yar`adua. However, David Edevbie and Yar`dua insiders are about to impose on one hundred and fifty million Nigerians an unauthorised budget with the seal of an unconscious President.